Here are some simple things to do and use to help you with your quilting. What is a QST? QST stands for quarter square triangles, which was something I happened to be cutting today. 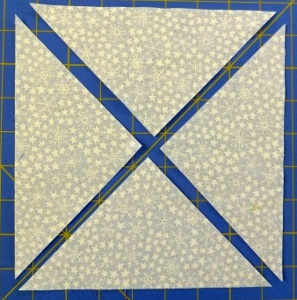 If you have been following along for the past 4 days, you will have learned a number of things about needle turn applique - what you need and cutting out the shapes, aligning the shapes in place and carefully stitching them down, and then how to make a quilter's knot and end off your thread. Today we will look at how to make a circle easily.